I’ve had to delay my arrival at Macworld Expo until Thursday. 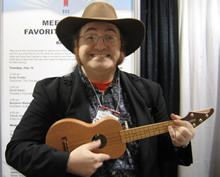 Look what I’ve missed: a USB-enabled ukulele. iGuitar custom-built the instrument for Mac personality and notorious uke player Andy Ihnakto. (Thanks, TUAW!) I’m guessing the USB carries only audio, not control — the company’s iGuitar.USB uses USB for audio but requires a separate converter to change signal from the specialized onboard pickups into MIDI control. I’m going to try to find out more about this from my friends at iGuitar. More soon.